Mystical details meet distressed elegance in this invigorating first floor update. Heavily distressed adler cabinets give the kitchen a raw, unexpected look, while majestic lighting and wallpapers create an opulent Great Gatsby flair in the dining room and bath. Together, these contrasts deliver an otherworldly style that’s impossible to ignore. Craving a style both rustic and magical, this client gave Lisa full reign to explore a dynamic, anti-staid look. Darker colors and wallpapers brought out new details in the woodwork and allowed lighting to become a feature rather than an afterthought. 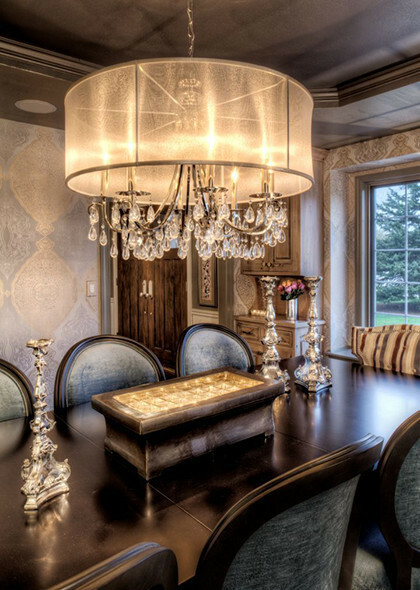 Silver and bronze accents provided an extra dash of glamour without steeping the space in over-indulgence.